Whether you are looking for the darkly gothic dress, the vampiress gown, or the devilish seductress attire, you will find that costume here, in our womens gothic costumes section. 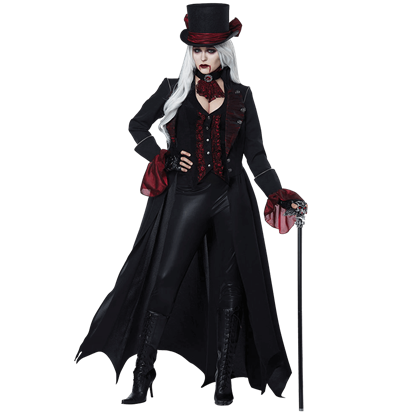 Here, you will find not only a number of gorgeous costumes that render any woman a darkly radiant beauty of gothic style, but also a few costumes that are not only beautiful, but just plain fun as well. Many of our costumes feature medieval-styled or renaissance-styled dresses, which is a staple in typical gothic fashion. 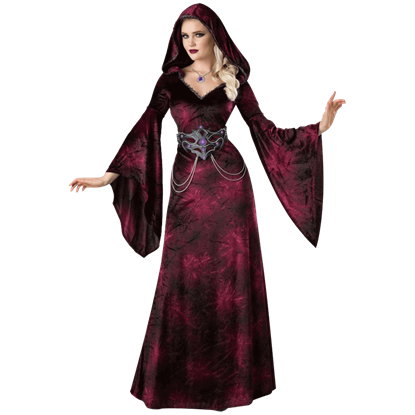 And with a color scheme that features a dazzling array of colors, from the traditional blacks and reds to the intriguing whites and purples, you will find that our womens gothic costumes appeal to a broad variety of discerning tastes. And most importantly, every costume offered is simply beautiful: they are gorgeous pieces that will lend the same quality to whoever wears them. So whether you are looking for something that is darkly vampiric, dangerously seductive, deathly pale, or just wickedly witchy, you will find it here in our gothic womens costumes and you can almost bet that it will be nothing short of stunning. 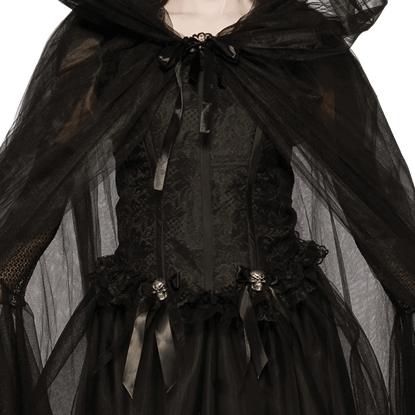 As black as night itself, this Black Midnight Gathering Skirt is a gothic garment that will leave others speechless. From afar, this skirt is a pretty, but up close is where it really shines, when all its detailing becomes apparent. This corset is a stunningly garment that features bright color and beautiful decoration. The Black Rose Lace Corset is just the jaw-dropping accent to wear whenever you want to take center stage and show off your impressive ensemble. Now you can exude elegance at your next social outing or formal event with the addition of this gothic top. With this Blackout Lace Sleeve Womens Top, you can combine gothic apparel with the current trends of elegant modern fashion. Kick up your heels in this flirty high-low satin and organza skirt. 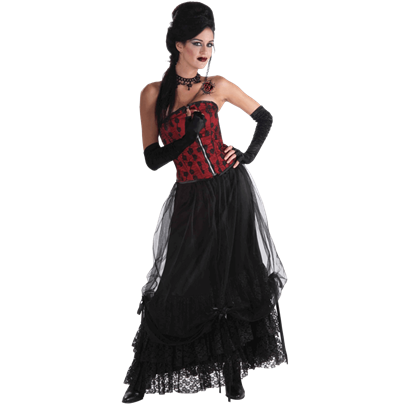 The Burlesque Skirt features rows of sultry ruffles, making it an excellent choice for a saucy saloon girl, winsome pirate wench, or a naughty Neo-Victorian vixen. The Corset from the Crypt is an ultra-versatile piece of gothic attire that you need in your wardrobe. This corset-like top can be worn as a standalone top that displays gothic flair, or as the terrific base for a gothic costume. When dark fantasy and contemporary design collide, a modern maiden will transform into a vampyric seductress. By wearing the Dark Damsel Overbust Corset, you can portray such a sinister temptress with elegant style and comfort! Moving with unearthly grace, the witch leads a procession through the catacombs. She performs the ancient ritual, chanting as she goes, with the Dark Realm Sorceress Costume Dress to assist in opening the gate to the netherworld. Positively slay with your deadly style when you wear the Dressed to Kill Womens Vampire Costume to your next costume party. Hypnotize your prey and impress fellow vampires when dressed in this unique gothic twist on Victorian fashion. Cara mia! When you wear this Frightfully Beautiful Womens Costume, you will feel like the most sublime creature of the night that ever roamed the earth. The trailing lace sleeves will beckon your gothic partner with every flourish. If you are looking to add a versatile piece of gothic attire to your wardrobe, look no further than this Gothic Black Ruffle Skirt. This skirt features ruffles that add volume to your look, and is made of comfortable polyester. 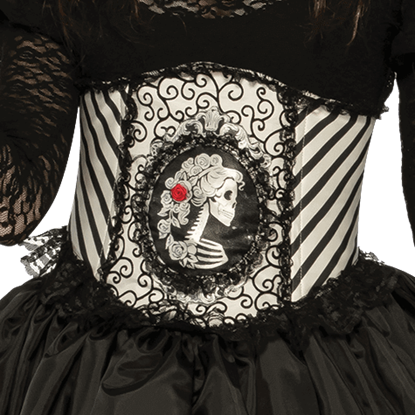 This eye-catching Gothic Skeletal Waist Cincher is sure to give you that hourglass waistline you desire. Highly detailed and beautifully designed, this wait cincher is the perfect gothic accessory for costumed events and gatherings. Originally, the crinoline was designed to support a womans skirts, giving it shape and form. 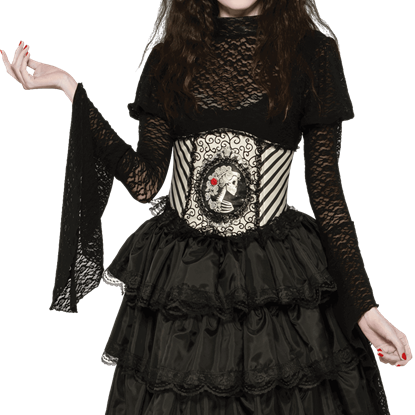 This Gothic Skull Crinoline Skirt, however, can do that and more, as this black and red skirt can be worn as a sultry garment all on its own.